Do you enjoy working with technology and hope to broaden your job prospects? Earning a bachelor's in computer programming online will open doors to a variety of technical careers in areas like networking, project development, and network security, all while affording you the flexibility to keep working while pursuing your education. During your degree, you'll build a foundation within the field and dive deep into fundamental topics such as programming languages, operating systems, and data structures and algorithms. Additionally, you'll find that many bachelor's programs offer courses in specialized computer programming topics that cater to your interests and future goals. As you search for the right online program, there are two factors to keep in mind: flexibility and affordability. Pursuing your bachelor's remotely allows you more flexibility than an on-campus program: most classes are taught asynchronously, which allows you to work during the day or take care of family obligations without disrupting your studying. There are also a number of affordable online computer programming degree programs to help you stay within budget. However, there's a difference between cheap and affordable: a cheap program just offers low tuition; an affordable one offers reasonable tuition and a quality academic experience on top of a history of high graduation rates and low student loan default rates. We've compiled a list of the most affordable online computer programming degrees below. Our College Affordability Score takes into account a variety of metrics, vetting the schools for you and taking out the guesswork. If you're interested in pursuing a computer programming degree online, explore these top schools and find an affordable, value-driven program that fits your needs. Western Governors is a private online university. The school offers degrees in business, education, IT, and healthcare. WGU’s online computer programming degree requires students to complete 122 credits of cutting-edge, IT-focused courses. WGU’s curriculum is based on current industry needs, and students learn about computer programming, mobile app development, web design and development, operating systems, and software development. Graduates receive several IT certifications over the course of their studies, including CIW certifications in website development and user interface design, along with CompTIA A+ and Project+ certifications. These certifications, in addition to a required capstone project in which students show of their programming chops, prepare WGU’s graduates for a career in the field. This program is ideal for professionals currently working in IT or programming. Bellevue University is a private school in Bellevue, Nebraska that primarily serves nontraditional students over the age of 25. The school offers a computer programming degree online: graduates earn a BS in software development and are exposed to a broad curriculum. In Bellevue’s online software development program, students learn a variety of essential skills, including how to develop software and mobile apps, how to design websites, and how to communicate in high-tech environments. This program requires students to complete 127 total credits, including 36 major-specific credit hours. Bellevue allows students to transfer credits that they've earned at other colleges. This university also offers discounted tuition for active duty service members. FHSU is a public university run by the Kansas Board of Regents with a main campus in Hays. In addition to educating students on campus, FHSU offers several affordable degree programs online. The university currently offers 50 programs that can be completed remotely, including a computer programming online degree program. Graduates earn a BS in computer science and are qualified to work in top IT positions in computer engineering, network architecture, software project management, web development, system testing, and more. FHSU’s computer programming degree requires that students complete 120 total hours, which consist of a combination of core college classes and beginning, intermediate, and advanced computer programming classes. Students are required to pick either a business or networking track. Those who pick the business concentration take business courses in addition to their IT coursework, while networking students take extra classes that cover the internetworking of computer systems. Southwestern College is a private, Methodist college based in Winfield, Kansas. The college’s Professional Studies Department offers several online degree options, including one of the best online computer science degree programs in the country, a BS in computer programming. The curriculum teaches students how to create algorithms, use coding languages like Java and HTML, design databases, and find solutions to complex IT problems. Southwestern's courses are offered in convenient, six-week sessions, which allows students to complete their degree quickly. A total of 126 credit hours are required to graduate. Transfer students are encouraged to apply, but they must have at least a 2.0 GPA in previous college courses to be admitted. Military members are invited to apply, and are eligible for a discounted tuition rate. Champlain College is a private school based in Burlington, Vermont. The college's 50 career-oriented online degree programs provide students with seamless access to the information they need to propel their professional careers. In particular, Champlain's online degree in computer programming stands out as an excellent option for students who want to pursue a career in IT. The BS in software development program prepares graduates to become software engineers, web developers, IT support specialists, and much more. Students will learn several computing languages, including C++, Java, and Visual C#. Students complete required coursework at Champlain in seven-week sessions offered throughout the year. Online students who opt to enroll in summer sessions can complete their degrees at an accelerated pace. Transfer students can receive credit for up to 90 hours of classes they’ve taken elsewhere. Hodges University is a private school with a main campus in Naples, Florida, a satellite campus in Fort Myers, and a virtual campus for nontraditional students. HU's virtual campus provides several degrees entirely online, including a BS in software development. Among online computer science degree programs, the one at Hodges distinguishes itself by requiring students to take courses both in software development and in business, which prepares them to tackle the challenges they’ll face in professional IT once they graduate. All faculty members have real-world computer programming experience and are able to guide students as they prepare for their careers. Hodges has a generous transfer policy, and students can even receive course credit for relevant professional experience. Husson University is a private, nonprofit university based in Bangor, Maine, and the school has two additional campuses in Westbrook and Presque Isle. Husson offers several fully online degrees in business, technology, and healthcare. Among online computer programming degrees, the offering at this university stands out because of its focus on software systems development and hardware development specifically for big businesses. The online BS in integrated technology requires students to complete a mix of business courses, computer programming courses, advanced mathematics courses, and IT electives, which prepare students to work in high-level IT positions at major corporations once they graduate. Students who transfer credits for core classes from other colleges can complete Husson’s computer programming degree program in just two years. In total, the program requires students to complete 121 credits, and students can transfer up to 90 credit hours from other institutions. Baker College is an accredited, private, nonprofit higher education institution based in Flint, Michigan. The school considers itself a “career college,” offering degrees in healthcare, business, technology, and education. Graduates from one of Baker’s 40 online programs, including the college’s online computer programming degree program, go on to secure top positions in their fields. 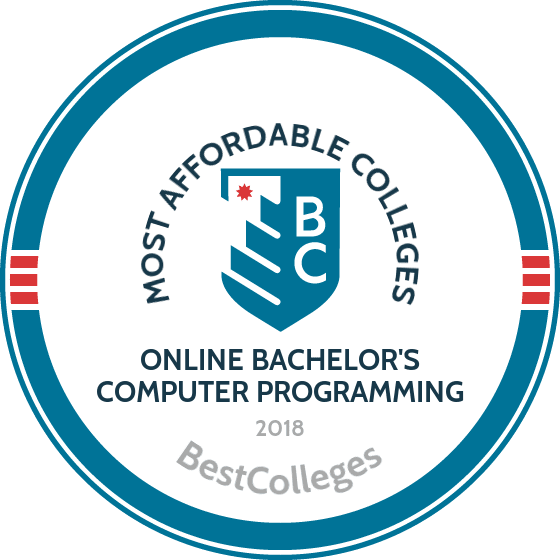 The BS in computer science program at Baker College is an outstanding choice for students who want to learn C++, Java, and C# programming, in addition to learning how operating systems and software systems are built. Online classes at Baker are taught asynchronously, and the college aims to keep class sizes small and collaborative, encouraging students to learn from each other and develop relationships with their professors. Once computer programming students have completed all of their required online courses, they are eligible for career counseling from Baker’s Lifetime Employment Services office, which can help them land a high-paying and rewarding position in IT. Davenport University is a private school with a flagship campus in Grand Rapids, Michigan and several other branches in Michigan and Pennsylvania, along with a virtual campus. The university primarily awards degrees in healthcare, business, and technology, producing highly employable graduates in all of these arenas. Davenport offers a comprehensive curriculum and an affordable degree. The online BS in database systems and programming program prepares graduates to manage corporate databases, model data, design software, manage software, and keep business systems secure. Davenport students learn how to code in C#, C++, and Java, and they learn Python scripting for all the major operating systems, including Linux. Online classes at Davenport are offered in both asynchronous and synchronous formats. Some synchronous classes are conducted using video teleconferencing software, and online students actually get to take these classes with students who are attending them in person. This makes their learning experiences highly collaborative and engaging. Limestone College is a private, Christian college with headquarters in Gaffney, South Carolina. Limestone offers 15 online degree programs in business, healthcare, psychology, technology, social work, and liberal studies. The online computer programming degree program teaches students everything they’ll need to know to work in software programming, software engineering, IT project management, and app development. The BS in computer science – programming program covers how computers work and introduces students to the nuances of designing their own systems and software. Limestone College’s online students take courses in eight-week sessions offered throughout the year. If they take two courses per eight-week session, as recommended by the school, they can complete their degrees at an accelerated pace. Additionally, Limestone’s transfer policy is very lenient, so transfer students have no problem finishing their degree ahead-of-schedule. Limestone also offers special services and discounted tuition to military members, in addition to offering scholarships to many of its online students.